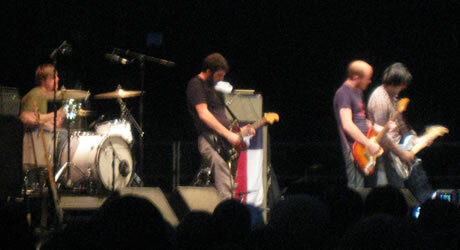 Explosions in the Sky is an instrumental post-rock quartet from Texas. Their characteristic formula of a chiming guitar power trio on top of pulsating drums is a bit more palatable than their extremely loud, menacing Scottish peers Mogwai (read our review of their April show in New York). Personally, I hear a kind of homogeneity to much of Explosions’ music that I don’t hear in other post-rock outfits like Mogwai, Sigur Rós, and Tortoise. To oversimplify their history, the band is primarily known for two factoids. In an unfortunate coincidence, their album Those Who Tell the Truth Shall Die, Those Who Tell the Truth Shall Live Forever, released a few days before 9/11, featured a cover illustration of a plane and a caption reading “This plane will crash tomorrow.” Long before I actually heard any of their music, I do recall this story helping to feed the 24-hour-a-day broadcast news hysteria that followed. Better bolstering their repute, they composed the popular score to Peter Berg’s 2004 film Friday Night Lights, and they’ve attracted a significant fan base – selling out outdoor Central Park Rumsey Playfield even in the rain. The band’s designated spokesman Munaf Rayani began the show by announcing it was their 10-year anniversary as a band. They played for about an hour and half without interruption, blending songs together into a continuous flow. From where I stood, the appreciative audience recognized and cheered many tunes. But Rayani apologized at the end of the show for things having “going off the rails,” and they walked off without an encore despite there still being some time before the Central Park curfew. For all I know, that may be their custom, but it was really surprising, and audibly disappointed everyone around me. Awkward.